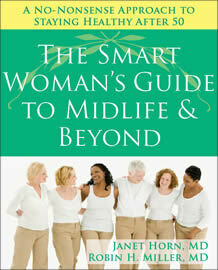 Addressing the specific health issues of women in midlife and beyond, the book focuses on the prevention of the most common diseases that occur as the body matures, and on the management of symptoms that may indicate a medical emergency. The most recent medical research pertaining to women of various ethnic groups and lifestyles is discussed, as are the latest treatments. Not only are specific recommendations from the traditional medical field given, but the book also offers suggestions from the field of Complementary and Alternative Medicine (CAM). Written in an informal and conversational style, the book gives easy-to-understand explanations of commonly used medical terms and concepts. In addition, the authors have created a method, called “The 4 A’s”, that helps you organize, simplify, and remember what you need to do to stay healthy and active, and they show you how to use it for all of their recommendations throughout the book. To make the book entertaining as well as informative, the authors include stories about their own experiences with aging and those of their patients, as well as their personal regimens of everything from exercise and eating to skincare. At the end of each chapter are included: A list of important take-home points to help the reader better care for herself, and a chat between the docs about the issues just discussed. A detailed suggested health maintenance schedule, a recommended reading list, and an extensive list of references are also included.